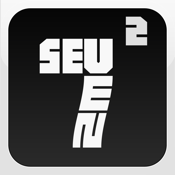 SEVEN² (SEVEN 2, SEVEN Squared) is a brand new brain-teaser. This word puzzler has an unique minimalist-styled interface and is built to satisfy the player hungers for real challenge. The game has a simple, relaxing, and addictive game play. On a board of 7² (or 49) tiles, you only need to link letters, score by making words and try your best to survive 7² (or 49) rounds. There is NO time limit. You can take as much time as you need to plan your next step. Does it sound too easy? Think twice! You need to be careful in spelling every word, turning the difficult letters to your advantage and strategically plan the positions of the falling letters to balance risk and reward. The game has a minimalistic art style which makes the player focus on the game. The fast paced yet challenging rules let the player enjoy the fun of a word game almost every where and any time. The game also features a night theme that can be quickly switched from day theme. You will find it a welcome feature during a sleepless night.